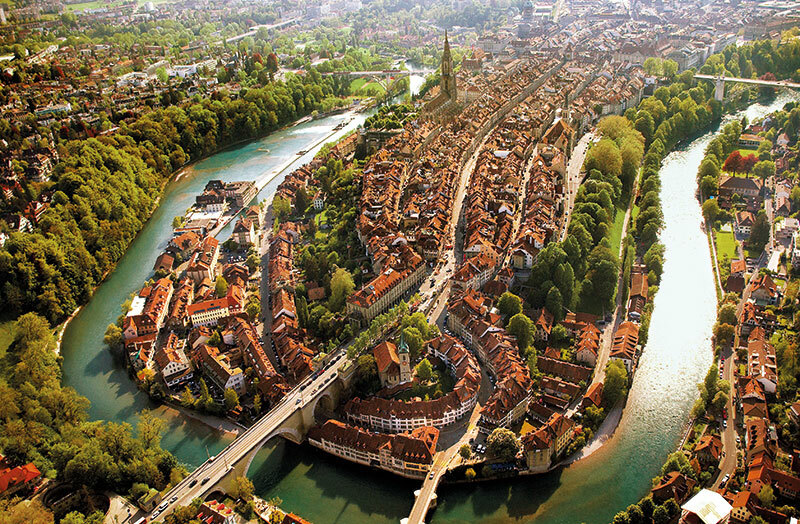 Bern, in comparison with other Swiss cities like Zurich, Basel or Geneva, strikes a more leisurely pace and vibe. 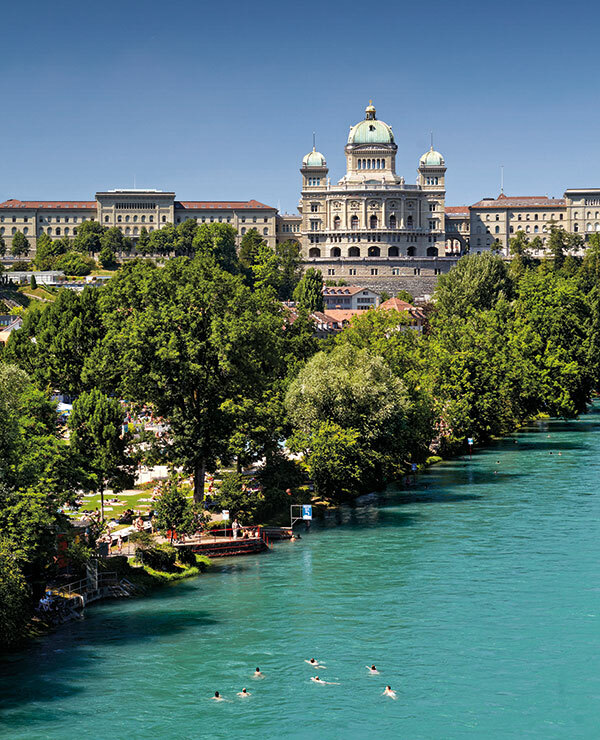 It has a picturesque medieval city centre (a section of which is a UNESCO World Heritage site) around which the river Aare winds its way, bringing snowmelt from the Alps and forming the principal attraction for Bern’s citizens during the summer months. Hundreds, indeed thousands, of Bern’s citizens can be found walking their way up the paths along the Aare on hot summer days or enjoying an invigorating swim in this river’s rather brisk current. This adventure is recommended for good swimmers only! There are a number of art highlights worth visiting Bern for, this season. In 2018, Bern celebrates the centenary of the Kunsthalle Bern, its contemporary art museum which has been an influential hub of artistic practice since its inception, radiating its influence well beyond the city and indeed beyond Switzerland. In 1968, the Kunsthalle Bern became the first building to be completely wrapped in reinforced polyethylene and nylon rope by artists Christo and Jeanne-Claude, at the invitation of its then-director, Harald Szeemann. Szeemann is commonly credited with creating the modern notion of ‘curatorship’: he radically broke with tradition by jettisoning the traditional academic art historical approaches of curating exhibitions. Instead, he was interested in the artist’s universe of ideas and showcased his own obsessive, encyclopaedic readings of history, literature, anthropology, art, politics, architecture and the so-called ‘outsider art’. Szeemann was concerned with exhibiting everyday objects as artefacts, challenging notions of what does and doesn’t constitute ‘art’, and thus broke with the conventions of art historical representation. Arguably his most seminal exhibition, Live in Your Head: When Attitudes Become Form (1969), brought together a whole array of little-known artists at the time, among others, Joseph Beuys, Walter de Maria, Lawrence Weiner, Richard Serra and Mario Merz. Szeemann went on to curate Documenta 5 in Kassel in 1972 and a number of important international exhibitions as an independent curator — among others, the 1999 and 2001 editions of the Venice Biennale. After Szeemann’s death in 2005, the enormous archive of his works was transferred to the Getty Research Institute in Los Angeles, where it constitutes the largest single archive in that institution’s extensive archival collection. Getty’s curatorial research team has set about organising, analysing and exhibiting this rich archive ever since it took possession of it in 2011. To mark the Kunsthalle Bern’s 100th anniversary, it therefore seemed fitting that the exhibition mounted by the Getty Research Institute would travel to Bern, among other destinations (Dusseldorf, Turin, New York). There are in fact two exhibitions dedicated to Szeemann. 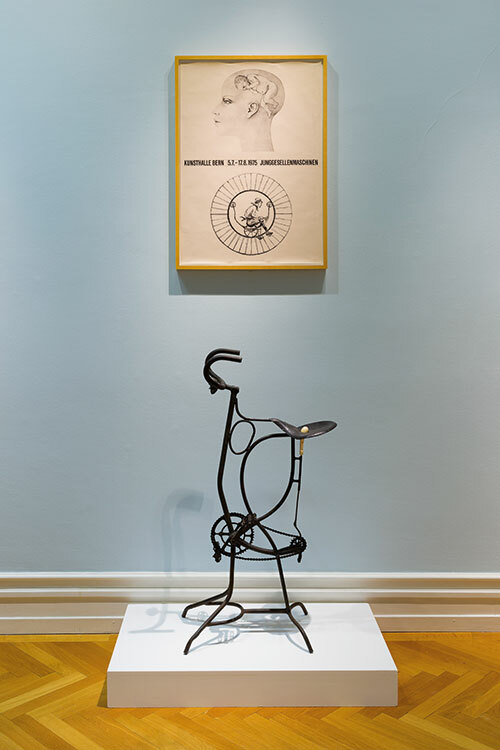 In the Kunsthalle itself, Museum of Obsessions showcases his work and accomplishes the difficult task of mounting an exhibition about an exhibition maker. An impressive amount of artworks, archival material, video footage and documentation of Szeemann’s seminal shows are assembled in this exhibition. The second exhibition is arguably the true ‘museum of obsessions’. The Getty’s curator, Glenn Phillips, had the audacious idea of restaging an exhibition which Szeemann had curated in 1974 in his own apartment in the old city of Bern. The exhibition, Grandfather — A Pioneer Like Us was Szeemann’s homage to his own grandfather, who had trained to become a hairdresser and wig maker in Vienna and later settled and worked in Bern. Himself an avid collector of artefacts, documents, photographs, diplomas and just about every piece of hairdressing paraphernalia, Szeemann’s grandfather died in 1971 and left behind a legacy dedicated to the very particular art of hairdressing and wig making — a legacy which Szeemann chose to exhibit with great dedication and obsessive attention to detail. The Getty researchers found that a considerable part of this exhibition’s archive and objects are still intact and decided to recreate a facsimile of the exhibition in Szeemann’s former apartment. The couple who currently live there have vacated the apartment for the duration of the exhibition. Both exhibitions are a must-see for anybody interested in the notion of curatorship, a term which has become so ubiquitous as to have been rendered empty of meaning in a time when people claim to be ‘curating’ their Instagram feeds. While visiting the Kunsthalle Bern, be sure to check out the temporary Kunsthalle Bar, a piece of ephemeral art and architecture created to mark the centenary by the artist duo Lang/Baumann. Fashioned like a modernist tree house around a linden tree, it affords lovely views of the old city and is a cool place to hang out for coffee and snacks. Bern’s Museum of Fine Arts, the Kunstmuseum Bern, is currently exhibiting Gurlitt: Status Report, Nazi Art Theft and Its Consequences. This is a fascinating exhibition documenting the legacy of the German art dealer and Nazi collaborator Hildebrand Gurlitt, who traded with so-called ‘degenerate art’ (as declared by the Nazis) and looted art from the fleeing Jewish population of Europe. Gurlitt’s son, Cornelius Gurlitt, rather incongruously bequeathed his father’s extensive collection to the Kunstmuseum Bern after his death in 2014. The Kunstmuseum Bern rather admirably set out to address this controversial and legally contentious gift by embarking on the arduous process of provenance research — an endeavour which involves art historians, provenance researchers, forensic scientists, lawyers and the descendants of Jewish Holocaust victims whose artworks were confiscated by the Nazis. 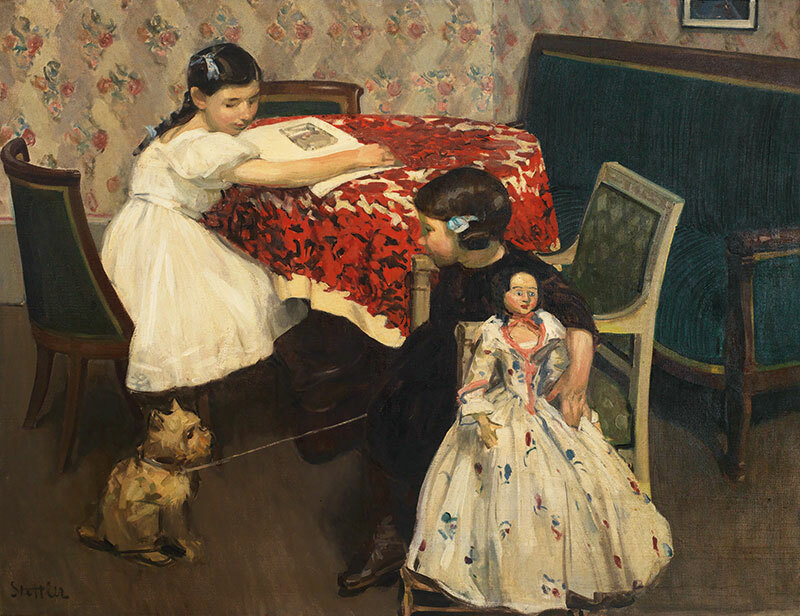 The Kunstmuseum Bern is also presenting a retrospective of the work of Martha Stettler (1870-1945), an influential late impressionist painter from Bern who co-founded and lead the Académie de la Grande Chaumière, a prestigious art school in Paris. 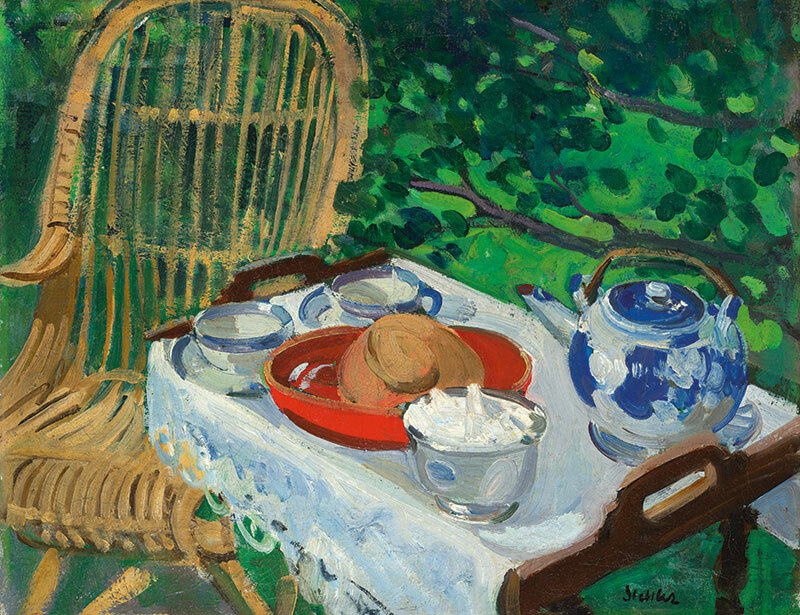 She lived with her Baltic artist partner Alice Dannenberg in Paris until her death in 1945. This retrospective is an appraisal of her work. Stores, bars, cafes to visit while in Bern…. One of Bern’s oldest clothing stores, which offers a wide selection of men’s and women’s clothing, accessories, lifestyle objects and shoes. It also stocks an array of inflatable swimming bags which the people of Bern use to place their clothes in when they take a swim down the river. Magnificent modernist ceramics from their famed ateliers located just outside Bern — timeless, elegant pieces which never lose their appeal. A nice place for a coffee or an ice cream in the daytime. It’s located on the large platform in front of the majestic Bern Münster Cathedral of St. Vincent and offers absolutely stunning views of the river, the surrounding old town and its private gardens. Worth visiting for lunch or dinner is the restaurant, which, in the summer, expands into the small square next door for simple and casual alfresco dining. This traditional, third-generation chocolate purveyor makes magnificent pralines. Go for the ones with dried apricot and the dried prune, as well as the champagne pralines.